India, quite frankly is centimeters short of being an internet superpower. 97% of urban teens in India have a social media account, results of a survey conducted in April 2013, depicted that the percentage of regular internet users in India is 12% which though is a lot less than what you would have predicted. But I assure you, by the time I finish this article, The number would become obsolete. A plethora of websites exist within India itself, Start-ups and even the old-timers are running towards the websphere to take advantage of an untapped resource. This being said, the citizens follow what the government or the leader does and this has the potential of massive yet aggressive growth. 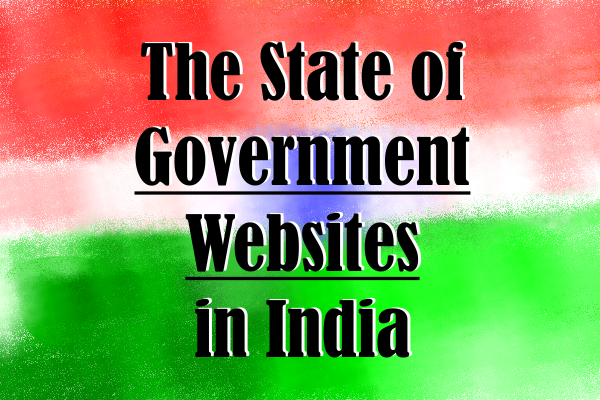 Let us look at how has the Government of India tried to milk the website cow. NTPC Ltd. or National Thermal Power Corporation Ltd. being a Maharatna Indian company had the obvious advantage of being on the top of others when it comes to spending of funds on marketing and promotion. Hence the website is well built Donning a verisign signature (A signature would certainly help websites usher faith in customers), the website is clean and minimalistically beautiful. Even then, when analyzing NTPC and ONGC with Google's page-speed insight tool, ONGC showed significantly less areas to be improved upon. ONGC, Oil and Natural Gas Corporation on the other hand, has a website that is filled with data from different sources. The website looks compellingly full, but lacks a bit in color combinations. Just like NTPC, GAIL to takes on a minimalistic approach. The website takes the green cover (Being a gas transportation Giant) and keeps its landing page to the smallest. Possible explanation would be to reduce the page-load time. Which is believed to increase the customer response. But this minimalistic approach is known to backfire. When you try and keep links (Both Internal and External) and text minimum on the landing or the index page, the user is bound to be confused, where should he go? The apparent lack of deep links prevents the users to explore easily increasing the bounce rate which of-course doesn't matter much. One of the most colorful and vibrant government website, TRAI, The Telephone Regulatory Authority of India has its website set up with the perfect blend of color combinations, eye catching images and required links. A search bar properly positioned on a website is a boon to a website. PNGRB or Petroleum and Natural Gas Regulatory Board takes up the full link approach. With several links on the index page itself, PNGRB has set a website for a busy employee with no time to indulge in page search. Talking about search, it however contains the banal yet powerful Google custom search. It is evident form the website contents that the current site is the new version of the old website. A commendable performance of the website, however is in the storage and retrieval of documents from the database . However, the meta-description just ruins the fun with consequent percentage values at the google search description. Airports Economic Regulatory Authority also known as AERA was created by NIC or National Informatics Center, by far the website is one of the best websites made by NIC. The colors and color patterns are carefully chosen and links though less are properly distributed. But what happens when the organisations do not take help of a professional institute like NIC, They make their own website, which painfully does not perform up to the mark. Take an example of AERB or Atomic Energy Regulatory Board. There is no difference in the functioning or the usability of the website from any other government regulatory body's website. The difference however comes in the presentation. The presentation for such websites are distasteful and brash. There is no doubt of the database security or methods, but what would an outsider tell about a website that has not been designed property? The AERB website just like GAIL is greenish in color (nuclear energy, duh!) but as expected the emblem of government of India does not fit well with a dark green background. The search box does not belong to Google, and the index page is an inexperienced mix of text and hyperlinks. The grotesque buttons and gifs are used in excess and hence lead to a different and negative image of the website both for the public and search engines. In some cases websites neither use the government based NIC for its works nor develop and maintain themselves. They look for a private firm for their job. take for example the Odisha Electricity Regulatory Board. The website is maintained by Addsoft Technologies. The website on one view looks filled to brim with links and text, but on a closer inspection, you would find that precious balance has been maintained. The website dons a photo created from images of different power generation facilities in Odisha. The photo is a good attempt at showing pictures from different sources instead of hosting several pictures thereby increasing the page-load time. Some government websites including Rajasthan Electricity Regulatory Commisson neither use a central government agency like NIC nor a third party, but use the information technological infrastructure of the state. Rajasthan Electricity Regulatory Commission, uses the services by RISL Rajasthan. The RISL was formerly known as RajCOMP or RajCOMP info services Limited. Coming back to the regulatory commission, The website looks pretty sturdy yet beautiful. The links are arranged properly within tables and also in text. The font chosen is better than many and the color is soothing. Data.gov.in popularly known as the Data Portal of India is one of the few websites with a dark background. The links and news on the website is carefully yet elegantly spread in windows 8 tab style. Unlike other government websites, this website does not actually use the marquee text used to give away the news. Instead, data.gov.in uses the feed system of placing news. The feed probably looks like a discolored twitter widget but nevertheless is one of the best website portion of the website. Regarding functionality, the website offers excel sheets and pdf files properly in the conventional table. As of now it contains more than 4000 data-sets with 51 departments participating in it. The website regularly updates and floats challenges for participation of youth. The font selection is mindful and the color selection is above average. The Article will be updated with time so as to bring more websites under codemakit's purview.